Manchester City won the Premier League on Sunday. Sergio Agüero scored a last-second goal, everyone went bananas, and all was full of love. It marked the first time City won the title in 44 years, and they did so at the expense of their intercity rivals, Manchester United. Then they started celebrating. That’s when things started going wrong. 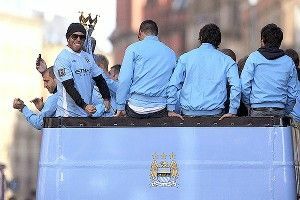 Things started getting off track when Manchester City forward Carlos Tévez (formerly of Manchester United) picked up a sign during City’s celebration and parade Monday. He probably didn’t look at it very closely. 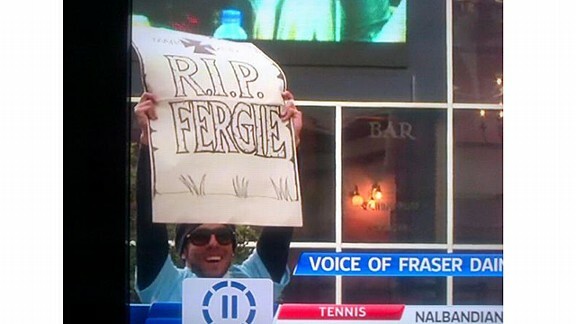 And much has been made about Tévez’s, shall we say, lack of interest in the English language. But I feel like “R.I.P.” is a phrase that transcends languages. put back in the cupboard (high-five to me for the mixed imagery there), another minor controversy was stirred up, when another City player took a shot at his former club. But it will be interesting to follow how City handle their burgeoning new role of top-dog club. They know how to win on the field. Next comes winning off of it.